Leo is an eleven-year old many middle grade readers will be able to relate to. She has four older siblings and is constantly told she is too young. She really wants to help with her family's bakery, but she is never allowed because of her age. Leo is determined to convince her family that she can help out. When she discovers a family secret, she has the perfect opportunity to prove herself. Leo discovers that, not only are all the women in her family bakers, but they are also brujas, or witches. The brujas of Leo's family get their power from magic combined with love and the sweetness of their baking. 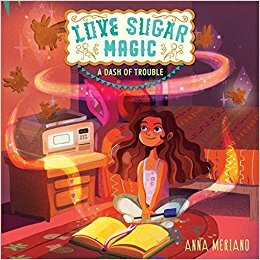 Even though Leo is not old enough to practice her magic, she tries her hand at the magical recipes. One problem leads to another when Leo's magic does not go as planned. Leo is a true-to-life character, good-intentioned, but not always making the best choices. Many young readers will be able to relate to the fact that, without meaning to, Leo has gotten herself into a really big mess. The element of fantasy and magic make Leo not just believable, but also interesting. There is warmth to this book, as well, as Leo's family support and learn from each other. The story also gives insight into the Mexican-American culture of Leo's family. Reading the book may give readers a craving for something sweet and luckily there are a few recipes included at the end. This is a charming and fun read. I received an advanced reader copy of this book at the National Council of Teachers of English convention, thanks to HarperCollins Publishers. The book publishes in January. Sounds like a fun plot with magic and food!